Will Renewable Energies Finally Get Their Chance in Argentina? BUENOS AIRES, Aug 14 2017 (IPS) - The first thing anyone who looks at any official document this year in Argentina will read is: “2017, the year of renewable energies.” This indicates the importance that the government gives to the issue, although translating the slogan into reality does not seem as easy as putting it in the headings of public documents. Renewable sources of energy today make up an insignificant proportion of Argentina’s energy mix. But under a law passed in 2015, with the consensus of all political sectors, this scenario is to be reverted in the next few years. The objective is not only based on commitments of turning to clean sources of energy undertaken by Argentina within the framework of global agreements to combat climate change, but also on the need, imposed by the economy, to expand and diversify the energy mix. For years, Argentina has been spending a fortune to import fossil fuels, although the amount has decreased, from seven billion dollars in 2014 to less than three billion dollars last year. However, that did not happen due to increased productivity or a diversification of local sources, but because of a fall in international oil prices. “Fossil fuels form an absurdly large portion of our energy mix. We have to change that,” Daniel Redondo, the government’s secretary of strategic energy planning, acknowledged in July in front of an auditorium of experts. “We are going to live up to the law on renewable energies, which stipulates that 20 per cent of our energy should come from clean source by 2025,” he added. According to official data, Argentina’s primary energy supply is based on 51 per cent natural gas and 33 per cent oil. With respect to power generation, thermal plants which use fossil fuels cover 64 per cent of the supply, while 30 per cent comes from hydroelectric plants. The country’s three nuclear plants provide four per cent of the total. Since 2016, the government has signed 59 contracts with private investors to develop renewable energy projects around the country. These initiatives, which should begin functioning next year, involve an overall investment of about four billion dollars, according to the Energy Ministry. These projects will jointly add 2,423 megawatts (MW) to the energy supply, which the state has assumed the commitment to buy and incorporate into the national grid, which currently has some 30,000 MW of installed capacity. Besides these projects, which form part of the government’s RenovAr Programme, the governor of the northern province of Jujuy, Gerardo Morales, announced that he signed a contract with the Power China company for the construction and financing of a 300-MW solar farm in the Salar de Cauchari, some 4,000 metres above sea level. During the visit, China consolidated its role as a key player in the renewal of the power industry in Argentina. In Beijing, an agreement was reached for the Asian giant to finance 85 per cent of the construction of two nuclear plants, with an investment of 14 billion dollars. Before the visit, they had agreed for China to finance the construction of two hydroelectric plants in Argentina’s southern region of Patagonia, at a cost of nearly five billion dollars. But the two mega-projects are still on hold by a Supreme Court order, in response to a complaint filed by environmental organisations. The government is keen on solving this situation, as the Chinese investors have threatened to apply a “cross-default” clause and block their investments in other projects. Energy Ministry officials reiterate in every public forum in which they participate that the goal is for 20,000 MW of power to be added to the electric grid by 2025, and for half of this to come from renewable sources. To finance this, the government created the Fund for the Development of Renewable Energies (Foder), which was endowed with 800 million dollars from the state, in addition to another 480 million approved by the World Bank to finance the projects. The ones that are already underway are mainly wind and solar power projects, since Argentina has favourable conditions for the former in the windy southern region of Patagonia, and for the latter in the high plateaus of northwestern Argentina, where solar radiation is intense. There are also small-scale hydroelectric and biogas projects. “This is the first time that Argentina is really moving forward in the development of renewable energies. Today we have what we used to lack: financing,” said Javier Cao, an expert in renewable energies for the economic consulting firm Abeceb. “The main driver of these initiatives is that Argentina has a large energy deficit and needs new power from all sources: from hydroelectric plants as well as the two new projected nuclear plants, while increasing its production of natural gas and also boost production from renewable sources,” he told IPS. Argentina’s dream of developing renewable energies is not new, but up to now all the efforts made had failed. The first law that declared renewables a matter of “national interest” was passed by Congress in 1998. But the financial incentives created by that law were destroyed by the late 2001 economic and political crisis that led to the resignation of President Fernando de la Rúa. In 2006 a second law was enacted, which set a target: eight per cent of the electric power consumed was to come from renewable sources by 2016. But once again, it failed, due to problems with financing. The third, which will hopefully be the charm, was passed in 2015, with votes from lawmakers who backed then president Cristina Fernández (2007-2015) as well as members of the opposition, in a rare example of consensus. This law created tax and customs incentives for investors and included among renewable sources hydroelectric dams up to 50 MW of capacity, in contrast to the ceiling of 30 MW set by the previous law. In addition, it established the obligation to reach the target of eight per cent renewable energies in the electric grid by Dec. 31, 2017 – a deadline that will not be reached. However, the government hopes to meet the target by 2019. The government does hope to reach the second target set by the law, on time: 20 per cent renewables by 2025. 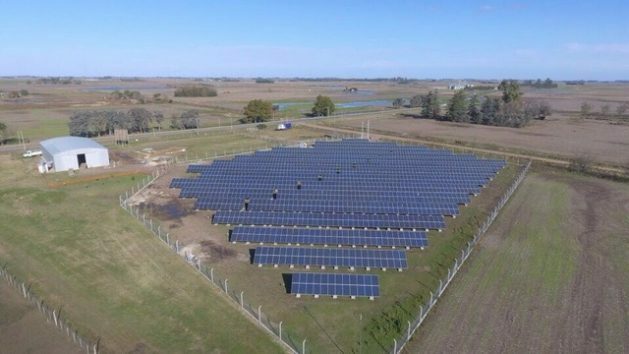 “One of the challenges in this respect is decentralising production,” said Marcelo Álvarez, president of the Argentine Chamber of Renewable Energies, which represents companies in the sector. 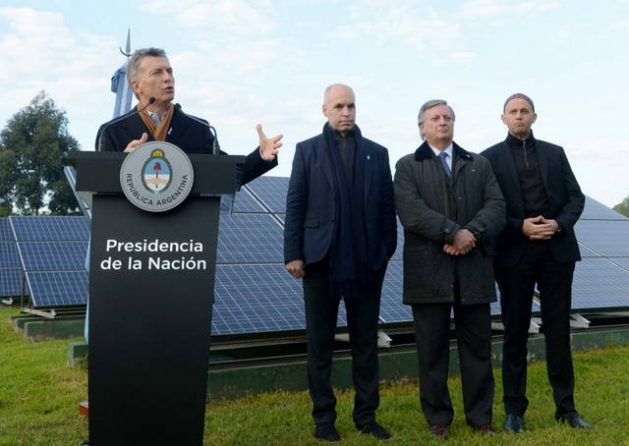 Towards that end, Congress is expected to pass a new power distribution law this year, which will allow users who generate renewable power to sell their surplus to the grid, which would be a real innovation in Argentina. “We already have achieved a unified text for the bill in the Energy Commission of the Chamber of Deputies, with the participation of technical advisers from all the parties and technicians from the executive branch,” said Juan Carlos Villalonga, a former Greenpeace environmental activist who is now a lawmaker for the governing alliance Cambiemos. “The take-off of renewable energies will be one of the legacies of this government,” said Villalonga. Within the Paris Agreement on climate change, signed by 196 member states in December 2015, Argentina committed itself to cutting greenhouse gas emissions by 15 per cent before 2030, a level criticised as low, but to which this country would add another 15 per cent if it receives special funds.